This entry was posted in airplane, Architecture, Art, Design, engines, industry, Launchers, RLV:s, Suborbital and tagged Boostback, Glideback, Re-entry, Turnback, Wainfan. Bookmark the permalink. That looks a lot like the “lift-assisted boostback” concept I was writing about in my “orbital access methodologies” series. Bet he beat me to the punch–most good aerospace ideas get reinvented at least a couple of times before they actually get implemented. And I am sure Gaetano Marano thought of it before both of you did Jon. 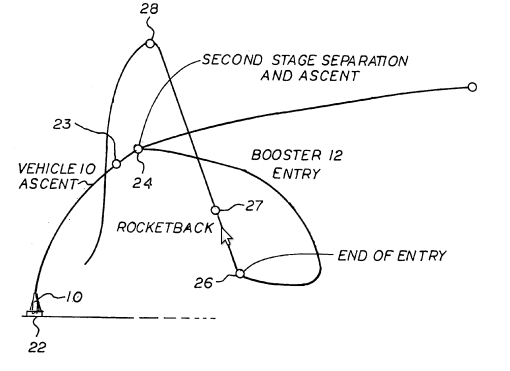 By not requiring any propulsion for fly-back,the 1st stage can be simpler, smaller. At first, Microlauncher vehicles will use experndables for the N Prize and another contest, then this glide/tow back method. The plane to do this can be small, as the towing load will be about 1/5 the empty stage mass, and it does not have to be raised in latitude. Charles, indeed, the tow back from a mid air hookup is potentially very nice since the distance can be quite long and it doesn’t require landing – it can be done over ocean as well as mountains and the tower’s propulsion can be better suited for it. You could also couple it with a parawing. But I’m intrigued why Wainfan ended up doing this trajectory. It seems overly complex and wasteful to first come down and then boost back up again. I’m sure he has found out something I at least don’t get yet. Why does it make sense to turn aerodynamically but then to boost up rocketly? Wouldn’t it be just as good to turn with rocket force and then start the glide from the already high altitude? Are these equivalent if we have a 45 degree angle trajectory? Scaled and XCOR should be interested in these as they are the only winged rocket vehicles flying nowadays. Well, Armadillo has the rocket racers but I assume it has a really Vne (top speed limit). If the facetmobile and it’s “PAV report” are anything to go by, Wainfan has the capability to generalize and abstract so that the problem’s crux becomes obvious. I suspect he experienced such a moment and went to patent.